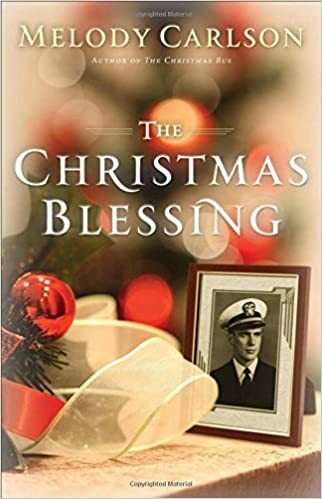 If you are looking for a book to lift your spirits, The Christmas Blessing by Melody Carlson is for you. I was caught between the pages from the beginning and read it straight through. It is close to Thanksgiving in 1944 and Amelia Richards is determined to take her infant son James to meet his grandparents for the first time. The only problem is, they don't know about her or little Jimmy. She met James, a handsome Navy pilot and they enjoyed a whirlwind wartime romance. They had a license and were set to marry but just the day before the wedding, the Navy called him back to duty. A duty that would lead to his plane being shot down over the Pacific. Amelia and little Jimmy embark on journey by train from San Diego to Rockford Montana. Down on her luck, she makes a decision that will change their lives for good. She finds a resilience and strength that she never knew she possessed. Montana is very different than San Diego and all too soon Amelia learns that she is alone and broke. I found her courage and determination to do the best for Jimmy very admirable. Melody Carlson captures the human spirit so well. Each year I look forward to her annual Christmas book. I recommend The Christmas Blessing wholeheartedly and hope you will pick up a copy at your favorite bookseller. This book has found a spot with my Christmas Collection and will be read again as the season draws near each year. 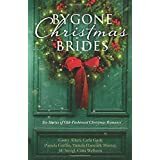 Bygone Christmas Brides, set in days gone by, is written by six authors sharing a bit of Christmas romance. Written by Ginny Aiken, Carla Gade, Pamela Griffin, Tamela Hancock Murray, Jill Stengl and Gina Welborn, these novellas will warm your hearts and spread a little welcome cheer as the summer wanes and darker evenings beckon. I enjoyed these stories, richly woven with tradition and the hope for love. Love at Christmas seems all the more poignant when the dreams of the young are often closer to the heart. Each bride carefully considered her groom, whether he knew he was being considered or not. Lost and Found by Ginny Aiken A young woman vows to remain single rather than marry the wonderful man she loves. the only problems is: he works at the mine. She is the daughter of an 1870's Welsh mine owner who will not suffer the loss of one more person she loves to that mine. 'Tis the Season by Carla Gade This story is set in Schooley's Mountain, New Jersey. The doctor's daughter met a carpenter who rescued her after her horse got spooked and tipped her carriage. She kissed him soundly afterward, an untoward action by a young lady of 1820, especially one committed to remain single to care for her aging father. Time, it seems would find a solution to a life without her handsome young man. I Saw Three Ships by Pamela Griffin tells the story of the love between Malcolm Sinclair and Rachel MacIvor. Set in Scotland in the middle of the 19th century, theirs is a love that formed as children and was torn apart when he was forced to leave unannounced for university. Now, he is the new Laird and must win back the love of the fiercely independent woman who wants no part of him or the rich life he can offer her. Colleen of Erin by Tamela Hancock Murray Finn Donohue, owner of the largest mercantile in Dublin, has long admired Colleen Sullivan from afar. He'll eagerly order whatever she needs or wants, knowing it will bring her once again to his store. He has worked hard to overcome hardships he and his mother bore when his father long ago left him. His bitterness lingers and his hard heart is the one thing that stands between the kind and gentle spirit Colleen possesses. As they spend time together, events occur that causes her to wonder if he can possibly change. It is a Christma visitor who opens the young man's eyes to the truth of his spirit. A Right and Proper Christmas by Jill Stengl A weary soldier returning from battle finds himself in the rector's home of a small town church. What he finds is incomparable love and service from a truly christian home. I found this novella inspiring for the unconditional love for mankind. Mercy Mild by Gina Welborn What better tribute to the Christmas spirit than a story of an orphan finding a new home with loving parents? Try a woman afraid to love a man because of the promise that love could bring a child to her unwilling arms. I enjoyed this story for the hope and change anyone can receive in their life with a little faith and push from those who truly love. Short though they are, novellas can give us a glimpse into a person's character more readily than a full book that needs to include a broader range of characters and events. If I like a novella I often hope it is the introduction of a new series being written by the author. For the season, we are often so busy preparing for Christmas that we may not want to contemplate reading a full book. This collection is inspiring and sure to put a little extra spirit in your heart. 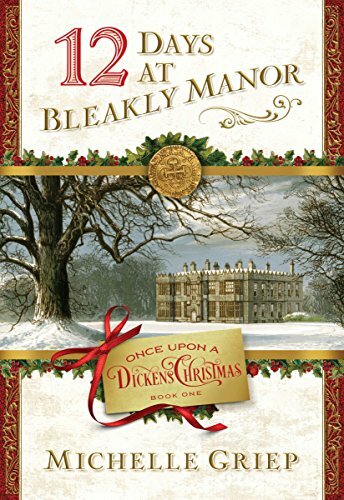 If you enjoy Charles Dickens and Agatha Christie, then 12 Days at Bleakly Manor by Michelle Griep is a book you want to savor by the fire. Great hosts can entice nearly anyone to a fine mansion for the holidays. In true bleak form, however, this is one place you may not want the carriage to stop. On December 24th, 1850, invitations were delivered to a select few who would spend the holidays at the stately Victorian manor. Your presence, Miss Chapman, is respectfully herald. Will be yours by rights." There would be no question she would go though she hated to leave the aunt she lovingly cared for. Go she did and what she found would change her life forever. Benjamin Lane, betrayed and marked with a prison tattoo languished in his cell, angry at the unknown person who stole his life, took his fortune and turned his only love against him. He too received an invitation to the manor but his invitation gave him no choice but to attend. Attend the twelve days at Bleakly and he may get his freedom. Escape from Bleakly and he would love his life. All who gathered at Bleakly were led there for a purpose. All sought the reward offered if they could but stay the twelve nights. Each day grew bleaker, however and death was not a stranger as mysterious events turned up and the guests numbers dwindled. As fate would have it, Clara and Benjamin had met before. She was his love, the one he lost through betrayal. He was the man who left her alone at the church humiliated. A humiliation that was heightened by the ruin of her family's business and fortune through embezzlement by the same man she trusted and loved. Who will remain and win the prize? If you seek the answer, read the book! A delicious plot complete with the Dickens flavor of Victorian England. Charles Dickens, my favorite author of all time, was a champion of the poor and mistreated. Agatha Christie would have loved the intrigue of the stately manor and absent host. I enjoyed the opportunity to read this book for review from NetGalley and Barbour Publishing. I recommend this book as one you will read this season and in seasons to come! 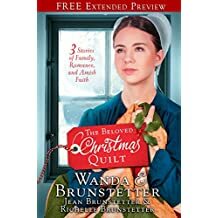 Beloved Christmas Quilt A Tale Lovingly Written by Wanda Brunstetter, Jean Brunstetter and Richelle Brunstetter. Luella's story is written by celebrated author Wanda Brunstetter. Luella is a sweet, unselfish young woman who is the caregiver for Dena, who is dying from heart disease. True to her unselfish nature she strives to provide loving care to Dena's son Daryl while keeping up with all the meals and household tasks. One day, Dena gives Luella a beautiful heirloom quilt, made by her mother. Dena intended to lovingly pass it along to her own daughter one day. She sees something special in Luella's heart and gives the quilt to her with the promise that she will continue to dare for Daryl and Atlee after she is gone. After Dena passes, Luella continues to care for Daryl as promised. As her love for the child grows, she begins to have feelings for Atlee. Although she is being pursued by Eugene Lapp, she realizes she is in love with Atlee, Daryl's father who is sixteen years her senior. The age difference seems insurmountable and Luella's parents are at odds to accept Atlee as a suitable husband for their daughter. Does a heart recognize age as an obstacle? Karen's story, written by Jean Brunstetter, is one that could resonate with any young wife and mother who has moved with her husband far from the family farm. Karen is lost without her parents nearby. She goes through the daily motions of caring for her young family but can't help but feel her life would be so much better if she could convince Seth to move back home to be closer to family. Seth, working through his own stress on the job feels the added pressure of Karen's unhappiness. His job provides a better income for his family than he could earn back home. Karen and Seth face what seems to be insurmountable differences. As she holds the Beloved Christmas Quilt close, she discovers the verse on the label and it provides her with comfort. Can she take heart in the verse as her mother did before her? Roseanna's story is written by newcomer Richelle Brunstetter, Jean's daughter and Wanda's granddaughter. Roseanna's story is that of a young woman who is left standing alone at her wedding by her beloved John. Her mother, Karen, wants to pass along the quilt to Roseanna, believing that it could provide a special comfort to her. Roseanna, knowing the history of the quilt, doesn't feel worthy of the quilt since John didn't marry her. After weeks of staying home, she finally goes to town and runs into Mark, who recently moved back to town. The attention he gives her is a welcome change after John's rejection. After staying with his aunt and uncle to think through his actions, John returned. He tried to explain what prompted him to leave but Roseanna refused to hear him out. But when a tragedy strikes her family will the dashing suitor or the man who truly knows her heart truly be there at her side? Once more the quilt provides comfort that so long ago was stitched into each layer. Like constant character in the story, a quilt that was a labor of love touched the lives of all who owned. I wonder how many of us have a treasured gift that was passed down through generation. The Beloved Christmas Quilt is a heartwarming book that will make a wonderful addition for your Christmas reading list!